If we then consider only one of the entities that are shared between our EA Model and our CMDB, it can be seen that although there are many attributes (columns) stored in our CMDB, only some of them would be required in our EA Model. E.g. our CMDB contains attributes relating to the IP addresses of servers but our EA Model would not. Also, although there are many records (rows) stored in our CMDB, only some of them would be required in our EA Model. E.g. our CMDB contains records relating to all the applications in use but our EA Model would only contain records relating to the most important applications. In addition our EA Model will need to contain more attributes that are sourced from other places. E.g. The cost of an application. 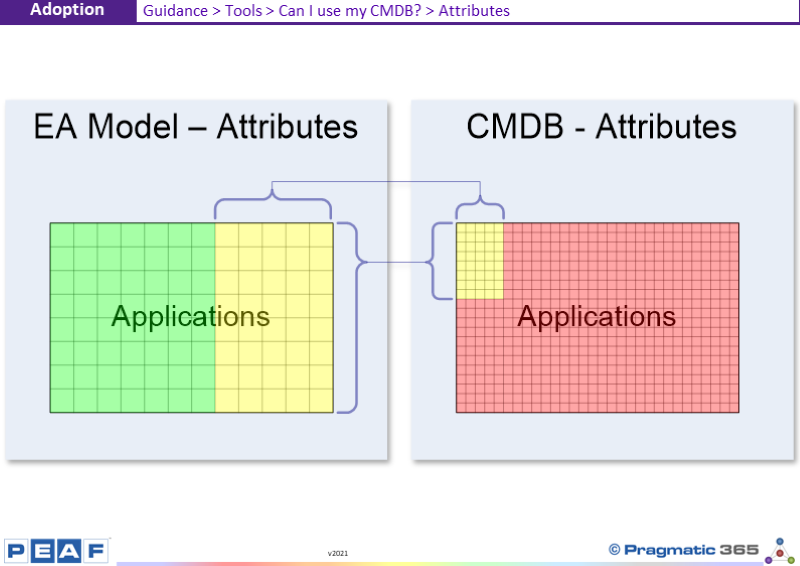 Do you integrate all Attributes, from all Entities from your CMDB, into your EA Model? What Properties are in your EA Model that are not in your CMDB? What Properties are in your CMDB that are not in your EA Model?